In 1932, the Whitman Publishing Company of Racine, Wisconsin began publishing Big Little Books. According to biglittlebooks.com, the books contained a large amount of reading material and pleasure (big) in a small and compact (little) book -- hence the unusual name. The books were produced used excess paper trimmmed from magazines. -- paper that would otherwise have gone to waste. Since the stories in Big Little Books were often borrowed from popular comic strips, they could be produced at little or no additional cost to the publisher. Big Little Books typically contained text on the left side pages and a full-page illustration on the right. Illustrations were lifted from the related comic strips. Whitman published several Big Little Books and other books written by Zane Grey between 1935 and 1942. 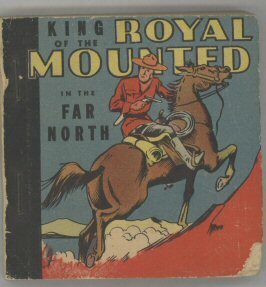 Most were under the title King of the Royal Mounted, a compilation of earlier comic strips centered around the character of Sergeant King, a Canadian Mountie who always got his man. They set the standard for similar books by other publishers, such as Dell and Fawcett. .
First editions of these Big Little Books command very high prices and are considered some of Zane Grey's rarest works. Even reprints of these books command high prices and are very uncommon. For those who are interested in learning more about Big Little Books, the website, biglittlebooks.com is an excellent resource. On their website, you will find invaluable information relative to the care of these paper collectibles and a definitive description of what these books are. Publishing data obtained from biglittlebooks.com. and other sources. Details: This book featured a Tarzan Ice Cream advertisement on the back cover. Distributed as a premium from Tarzan Ice Cream. Details: Based on the comic by Zane Grey. Cocomalt ads printed on rear cover and inside wrappers. Distributed as a premium from Cocomalt. Whitman Publishing. 1936. Hard cover. Standard size 3 5/8" x 4 1/2" x 1 1/2"; 432 pages. Details: The first KORM Big Little Book. Outline by Zane Grey with text written by Romer Grey. Whitman Publishing. 1937. Hard cover. Artist: Allen Dean and Charles Flanders. Details: Flander's art starts on page 284. Previous art is by Dean. Standard size 5 9/16" x 7 3/8"
Author: Romer Grey, son of Zane Grey. Whitman Publishing. 1938. Hard cover. Details: Outline by Zane Grey with text written by Romer Grey. In addition to Big Little Books, Whitman Publishing also printed Better Little Books, Penny Books and Buddy Books. Whitman Publishing's success spawned competition from other publishers. Dell Publishing produced Fast Action Stories, Large Feature Comics and Feature Books. Some of the Zane Grey titles produced by these publishers are listed below. Standard size 11 1/4" x 9"
Details: This is more similar to a comic book than a Big Little Book. Numerous Zane Grey Comic Books have been produced and sold in addition to the ones on this page. For information on Zane Grey comic books, click here. David McKay Publishing Co. 1937. Dell Publishing. 1938. Hard cover. Whitman Publishing. 1938. Soft Cover. Details: This book was a Buddy Book, one of many kinds of imitations and spin-offs of Big Little Books. Whitman Publishing. 1939. Hard cover. Author: Zane Grey and Romer Grey. Whitman Publishing. 1939. Soft Cover. Standard size 2 1/2" by 3 1/2"
Details: This book is a Penny Book, one of many kinds of imitations and spin-offs of Big Little Books. There is now evidence to support the basis that this Penny Book is the Buster Brown Premium giveaway. Buster Brown would apply stickers or a stamp to the back of this book indicating it was sponsored by Buster Brown. Whitman Publishing. 1942. Hard cover. Details: Adapted from the works of Zane Grey. Contains two flip-it features (Mounty stalks and captures a criminal; Mounty encounters a bear).